Building a radio in 10 minutes. 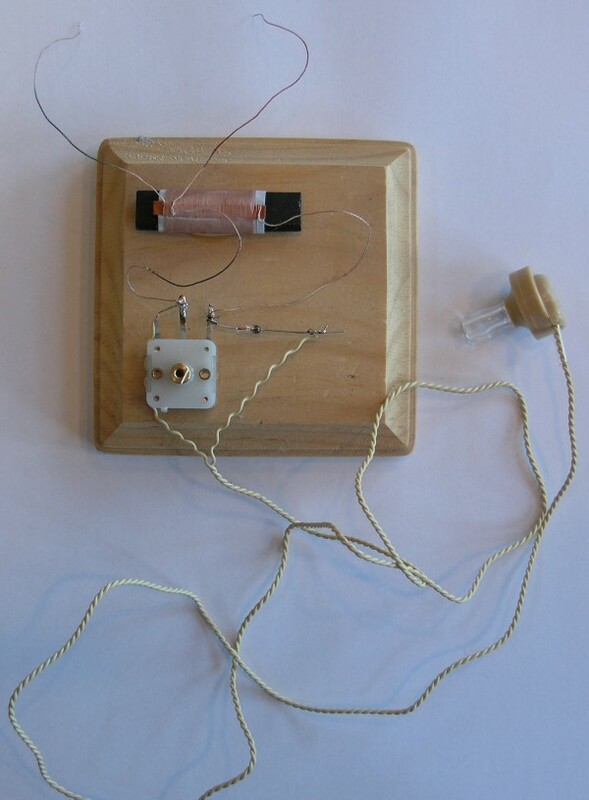 In our other crystal radios we wound the coil by hand. In this project we use a much smaller coil with a ferrite rod inside, from our catalog. The ferrite rod allows the coil to be smaller, and it can be moved in and out of the coil for coarse tuning. We carry this in our catalog. You can also find them in old broken or discarded radios. We carry this in our catalog. We use alligator jumper wires here for convenience. They are used to connect the ground and antenna wires to a good ground and a long wire antenna. We carry these in our catalog. About 50 to 100 feet of stranded insulated wire for an antenna. This is actually optional, since you can use a TV antenna or FM radio antenna by connecting our radio to one of the lead-in wires. But it's fun to throw your own wire up over a tree or on top of a house, and it makes the radio a little more portable. You can see from the photo how simple this radio is, and why it can be put together in a very short time. The black painted wire from the ferrite loop is soldered to the center lead of the variable capacitor. The unpainted wire is soldered to the rightmost lead of the variable capacitor. The germanium diode is soldered to the rightmost lead of the variable capacitor. One of the piezoelectric earphone wires is soldered to the free end of the germanium diode. The other is soldered to the center lead of the variable capacitor. The red painted wire of the coil is attached to the long wire antenna with an alligator clip lead. The green painted wire of the coil is attached to a good ground (such as a cold water pipe) using another alligator clip lead. We will start the tuning with the variable capacitor set in the middle of its range, neither all the way clockwise, nor all the way counter clockwise. With the earphone in your ear, slowly move the ferrite rod into the coil, listening for radio stations. With a long antenna, you can tune several radio stations. In some areas, one or two stations will be so close or so powerful that they overwhelm all the others, and you will only hear those one or two stations. How does the ferrite change the frequency? The ferrite rod increases the inductance of the coil. In our other (hand-wound) coils, we increased the inductance by winding some more loops, or by using a "tapped" coil, and selecting a tap that was farther down the coil. As the ferrite rod is inserted into the coil, more of the coil is affected by the ferrite, and so the inductance increases. Increasing the inductance moves the frequency lower. This allows us to hear stations "lower on the radio dial". Ferrite is used because it is magnetic, like iron or steel, but it is not a conductor of electricity. If it were conductive, the coil would induce "eddy currents" in it, and some of the energy would be lost heating up the core. Because ferrite is not a conductor, we can use its magnetic properties to change the inductance of the coil, without losing volume. If you have a long antenna, a good ground, and you are not too close to a strong station, the variable capacitor will help in fine tuning the stations. There are actually two coils of wire wound around the ferrite rod. The large coil is connected to the variable capacitor. The small coil is connected to the antenna and ground. This arrangement allows the radio to be more selective, so that strong stations don't drown out the weak ones. Really strong local stations will still overwhelm the more distant stations, however. 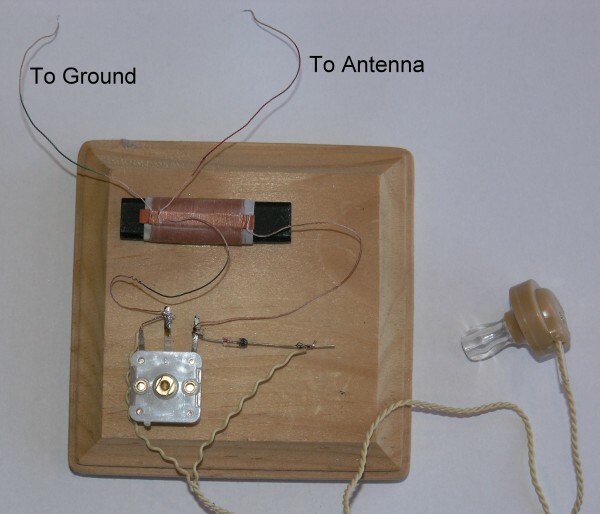 If you have no strong local stations, you can make the stations you receive sound louder by connecting the antenna and ground directly to the large coil. Connect the antenna to the center lead of the variable capacitor, and the ground to the rightmost lead of the variable capacitor. The stations will be louder, but they will most likely all be heard at once, since you radio will be less selective in tuning out adjacent stations. For more information on radio, see the Recommended Reading section. Order radio parts and kits here. Chapter 7: Light and Optics -- Build a laser communicator. Send your voice over a laser beam.